Heat oven to 425°F. Cut squash in half; remove seeds and fibers. Place squash cut side down in 13 X 9 inch pan. Carefully pour 2 cups cold water into pan. Bake squash about 40 to 45 minutes or until knife easily penetrates squash. Carefully turn squash over to cool slightly. Scrape inside of squash with fork; place in bowl and keep warm. In 12-inch skillet heat oil over medium heat. Cook and stir onions and garlic about 2 minutes or until onions are tender. Stir in squash, herbs, cheese, salt and pepper; toss until well blended and hot. Serve topped with pine nuts. 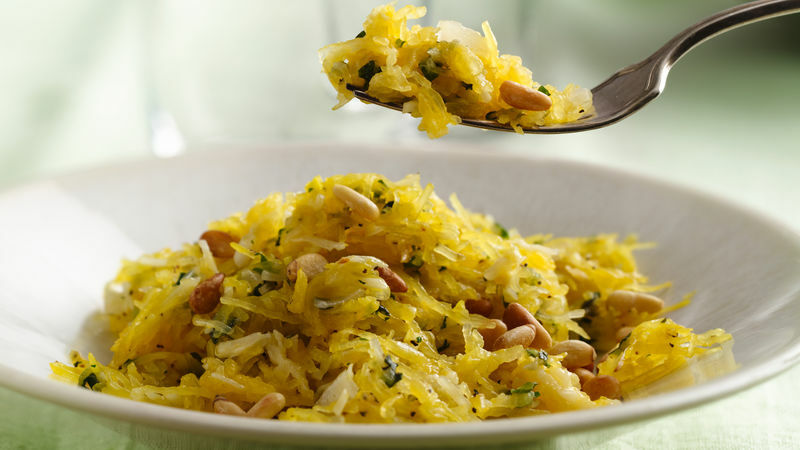 Cook spaghetti squash with garlic and herbs for a flavorful dish.